A. Fishman & Son - Ideal Cut Diamonds: What's it all about? Ideal Cut Diamonds: What's It All About? "The notion that there's something special about one set of proportions which is not produced by another set, just doesn't hold up." Manager of GIA Research and Development, New York. At A. Fishman & Son, we focus on offering our customers "well cut" diamonds that are pretty (See What Makes a Diamond Pretty? )and reflect full brilliance and fire. What do we mean by "well-cut" and how do we distinguish our cut from "ideal" cut, "super" ideal, or "ultra ideal" diamonds? While we own and offer many diamonds which have proportions which would be considered "ideal" cut, they are all very fine cut diamonds. However, unlike our diamonds which fall within the "ideal cut" proportions, there are many diamonds which fall within those "numbers" but whose cut is in fact poor and those diamonds are not pretty diamonds. 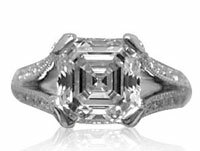 Like the Gemological Institute of America (GIA) (see below) , we do not feel it is appropriate to use the term "ideal," as it reflects the concept of "perfect." And we do not believe that all diamonds which fall within the "ideal" cut proportions deserve the connotation that the term implies. Not all certificated diamonds are pretty, including diamonds with "ideal," "excellent," or "very good" cut grades. The certificate is only the place to start from. There is much more to understand. Let me briefly explain, but please do not hesitate to call me if you would like to discuss this most important issue in greater depth. An “ideal" cut diamond refers to a round diamond cut to a specific set of cutting guidelines that delineate the proportions that are assumed to give a round diamond the greatest amount of fire and brilliance. There is a tremendous amount of information, some good and some very misleading, regarding what an "ideal" cut diamond should look like and what proportions it should be cut to. One of my biggest issues with the concept of "ideal" cuts is this.If an "ideal" cut diamond reflects a single set of cutting proportions which are "perfect," how is it that the depth and table percentages can have such a wide range? The traditional proportions often quoted for ideal cut - and "established" by the American Gem Society (AGS) is a table percentage of 52.4-57.5% and a depth percentage of 58.4-62.9%. This set of proportions assumes that any two diamonds whose proportions are cut within these ranges is equally pretty and look alike. Is this really possible? Is it possible that two diamonds which fall within this range, but at the extremes, really look the same? In our opinion, and the opinion of the GIA, this is patently false. A diamond of 60 depth and 57 table may be a pretty diamond, but, in our opinion, a diamond of 62.9 depth and 53 table is not. And it is obvious to any one who thinks through the issue that these two diamond will not look the same to the eye. Recently, the GIA has undertaken research to determine whether the noted cutting proportions of "ideal" cut stones actually produce the maximum fire and brilliance in a round diamond compared to other cutting proportions. "The results of this study suggest that there are many combinations of proportions with equal or higher WLR (weighted light return) than the traditional 'Ideal' cuts. In addition, they do not support analyzing cut by examining each proportion parameter independently." In fact, the research in this case showed that round diamonds with larger tables (64-66%) and with shallower crown and pavilion angles (not the 35.8 degrees on the crown and the 43 degrees on the pavilion often mentioned), delivered MORE light return than traditional "ideal" cut proportions. "We also know that there are many combinations of proportions that yield equally attractive round-brilliant-cut diamonds. In fact, we know that diamonds can be cut in a fairly wide range of proportions to yield the same high light return, which can lead to better utilization of the rough and a better fit with the myriad tastes that exist in the global marketplace. Early on, researchers at GIA expected their results to corroborate one or more of the existing cut grading systems, but their work to-date indicates the underlying approaches of most existing systems are not substantiated by the data. The industry has for decades embraced the concept that an extremely limited set of round brilliant diamond proportions produce maximum brilliance and fire so, in terms of an evaluation of cut, any deviation from this set of proportions would impact the appearance materially. It believed that the further the proportions deviated from this limited set of proportions, the greater the impact was on the appearance of the diamond. Proportions need to be considered in an interrelated manner. The combination of proportions is more important than any individual proportion value. Individual proportions must not be assessed on their own. It is the complex interrelationship of individual proportions that matters most in the face-up cut appearance and overall cut quality of a diamond. There is no one set of proportions that yields the most beautiful diamond. Similarly, the long-held view that expanding deviations from a fixed, arbitrary set of proportion values produces diamonds with increasingly poorer appearances is simply not valid. Attractive diamonds can be manufactured in wider range of proportions than would be suggested by historical practice or traditional trade perception. Viewing environment plays an important role in diamond appearance -- to be attractive, a diamond should look good in realistic environments. Personal and international market preferences should be accounted for. Diamonds with different appearances can be found within each cut grade, so individuals need to look at the diamond itself, not just the grade -- to choose the one they like best. What does all of this mean to you, the consumer? It means that you need to rely on the expertise of a diamond source that understands what diamonds are all about, that can evaluate the merits of a diamond beyond the mere statistics that appear on a certificate, and that can guide you to the right diamond for you. That diamond source has to have the experience which only time and generations of buying diamonds can give you. After all, if you never have to put your own money down (like the hundreds of internet sites who simply collect nationally available diamond lists), how can one really understand which diamond is desirable and which one is not! At A. Fishman & Son, we have over six decades and three generations of experience in buying diamonds and selling them. We have always put our money where our mouth is and invested in "pretty" diamonds which will please our customers. It is that experience which you can count on to assist you in your diamond selection.